Digital Marketing: Where to Focus in 2015? We all have limited time and budget, so reconsidering where we invest is a constant throughout the year, but especially during budget planning season. 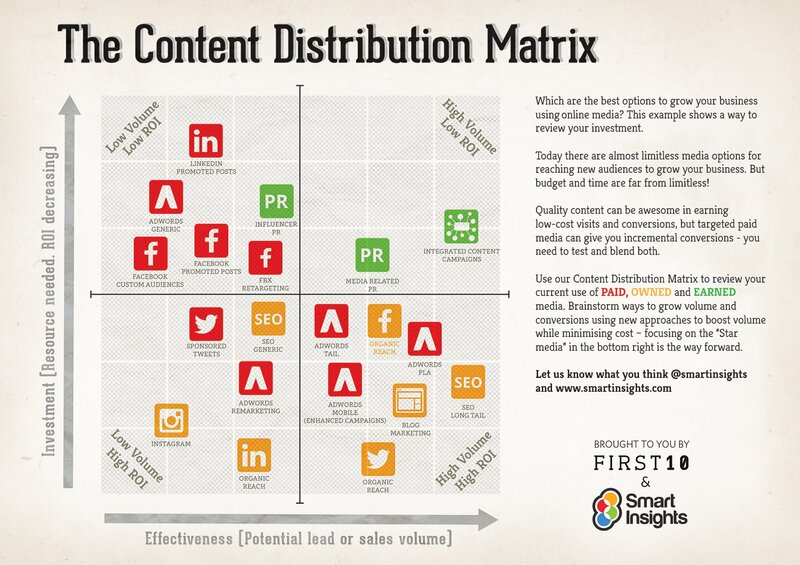 To help inform review of media budgets within teams and between team and agency I recently created this “Content Distribution Matrix”. Although it’s named around content marketing, it can be applied more widely for considering effectiveness across all types of paid, owned and earned media (definition). You can see that different types of example media have been added for one business - the matrix will look different for every business and it should change as you test new types of media - you can see there are many paid placement options now available for content marketing. Step 1. Current use of media for content distribution. Step 2. Review promotion gap against competitor or sector use of content distribution techniques. Step 3. Select and prioritise new methods of content promotion. Wasteful media (Lowest volume, Highest cost). Your aim here should be to reduce costs through budget reallocation and/or efficiency improvements. Slow and steady media (Lowest volume, Lowest cost). The least important to act on, but you need to make sure you are not distracted by these. Here, the aim is to minimise costs and review potential of techniques for improvement. High-cost volume driver media (Highest volume, Highest cost). You should aim to reduce costs and make efficiency improvements. Star performers (Highest volume, Highest cost). The aim here should be to build on your success to bring more resources to bear to scale volume further. What are the most popular digital media channels for 2015? To find out which media channels marketers think are most effective as we enter 2015, I recently completed this research into Managing Digital Marketing in 2015. 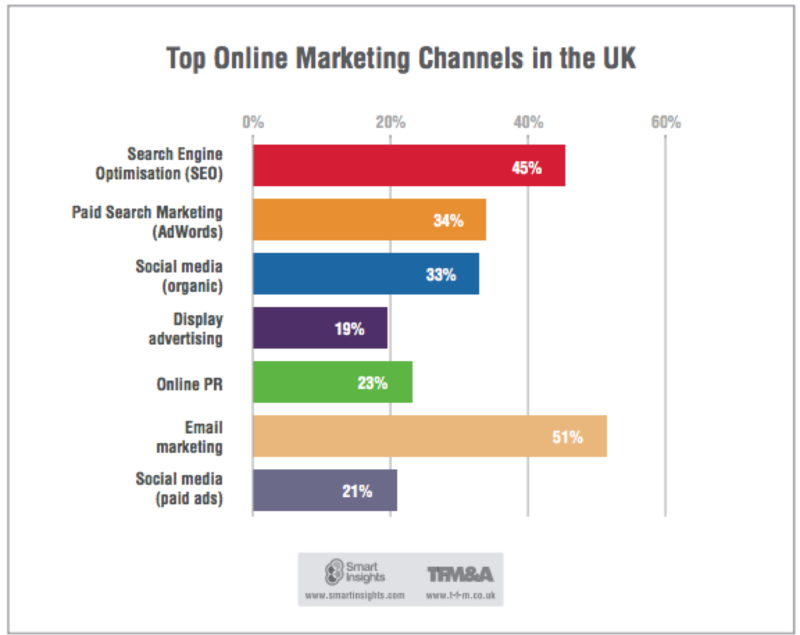 It showed the top rated channels to be the usual suspects - that’s search and email marketing. Email marketing was rated as highly or very effective by 51% of respondents followed by SEO (45%) and AdWords (34%). Organic use of social media wasn’t far behind with 33%, but with only 21% believing paid social media was effective. Many marketers are planning to increase investment across these channels with Email marketing (59%), SEO (51%) and AdWords (46%) leading the pack. Other charts in the report gives more detail on the cost-effectiveness across different paid, owned and earned media. We also asked respondents where they felt there was a lack of focus in their organisations. The two areas which were rated as needing most attention were measuring, testing and optimisation (53% rated these as receiving insufficient time) and Planning (46% rated). So, these are seen as missed opportunities by many. What is the reason for this? Well, time and budget has to be allocated above and beyond campaign activities for these, so it seems to suggest that those that control budgets don’t consider these as important yet the leading organisations in our report put more time into these. By July 2016, we’ll have more challengers live in a visit than competitors launch in a year"
He also reported that you need to invest in a range of tests since naturally not all will be successful with around one third giving a significant improvement in revenue, one third failing and one third neutral. We certainly believe in this measure, test, learn approach at ClickThrough Marketing and many client landing pages are constantly revised and tested to get the most from them.